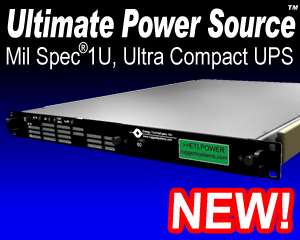 The field proven Military Power� UPS line is ideally suited for military, industrial, computer and telecommunications applications requiring high reliability, rugged construction, compact size and light weight design. These units are equally suited for use in shipboard, airborne, vehicular, field deployed or fixed locations with controlled or uncontrolled environments. The ETI0001-1486 was specifically designed for General Dynamics ATS systems requiring high density power in shallow depth racks. The ETI0001-1486 does not require a separate PDU since the PDU functions are already integrated into the UPS module. This saves rack space, cabling and expense while improving overall reliability. The internal shielded input transformer provides galvanic isolation with provisions for both domestic (115 VAC, CONUS) or optional autoranging international input voltages (85-270 VAC, OCONUS). The optional autoranging input voltage selection allows inputting either 115 VAC or 230 VAC without having to open the UPS enclosure. Special EMI/RFI filters and input power factor correction minimize both input current and harmonics. The input circuit breaker and the galvanic isolation transformer all provide a double pole isolated source for all installations including shipboard systems or overseas locations where phase references and grounding are not consistent.